Everyone and their dog — literally — has a different idea of what makes a good meat loaf. Advice columnist Ann Landers learned this after publishing her sister’s meat loaf recipe in 1959. One reader won a cooking contest with it, another said it was so awful the dog wouldn’t eat it. So I’m just going to give you the basics of meat loaf, and you can try whichever combination of ingredients sounds good to you. Both Ann Landers’ sister and Michael Ruhlman, author of Ratio, recommend using one egg to every pound of ground meat. The meat can be hamburger, ground pork, ground turkey, sausage meat, even a mixture of hamburger and ground pork. I’ve never tried making it with soy hamburger, which seems a little too dry for it. 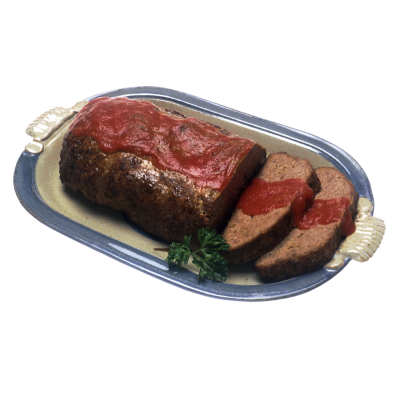 And while it’s possible to make meat loaf with leftover cooked meat, that takes more liquid and a different cooking method to keep it from drying out. Besides meat and egg, you’ll need some filler. No fair using too much — that’s probably what gave many people their idea of meat loaf as cheap and bland. Breadcrumbs are the classic filler. The Landers recipe calls for 3/4 cup for each pound of meat; Ruhlman recommends a couple of slices of bread, broken up, soaked in milk, and then pressed dry. I myself use quick oats, about 1/4 cup for each egg/pound of meat, and I mix them with the egg before adding both to the meat. Oats are healthier than breadcrumbs, and they soak up the juices nicely. I’ve also used cooked rice, but my family didn’t care so much for the texture. Instant stuffing mix, especially when it’s on clearance after Thanksgiving, is also an option, and it cuts out the need for seasoning. Seasoning, now that we’ve mentioned it, is where it gets tricky. Your meat may be seasoned already, for example if you’re using sausage meat or seasoned burgers. Be cautious about adding anything till you’re familiar with its taste. If you’re using plain ground meat, the minimal seasoning is, according to Ruhlman, about 1 1/2 teaspoon coarse salt to each pound. (If you’re putting in commercial seasoning like soup mix, leave out the salt altogether.) Chopped onions and garlic can be good if your family likes them; so can a teaspoon of dried herbs, like basil, for each pound. Meat loaf should cook at 350°; a pound will take about 45 minutes, two pounds about an hour. You’ll know when it’s done by the internal temperature — the U.S. government says 165° for poultry, 160° for other ground meats, Ruhlman says 155°. I leave it to your judgment. If your ground meat is fairly high in fat, you may want to cook the meat loaf on a rack, or make some other arrangement for draining off the grease. While it’s cooking, you can put on a sauce if you like — anything that’s fairly thick, from ketchup to gravy. It’ll cook into a coating for the finished meat. But this is strictly extra. Meat loaf doesn’t reheat well — but it makes good sandwiches.